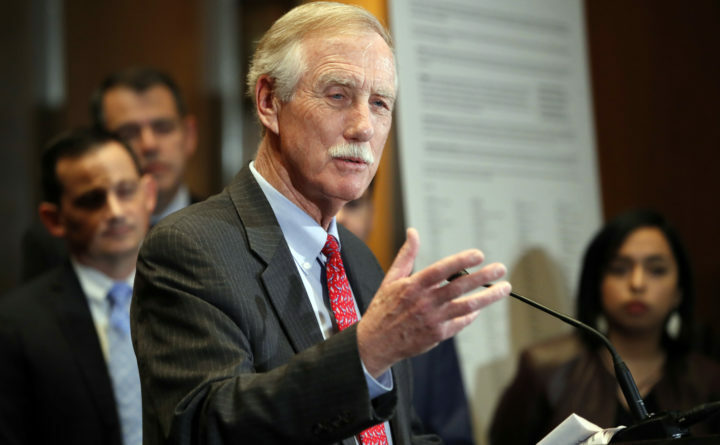 Sen. Angus King, I-Maine, speaks on Capitol Hill in Washington in this Feb. 7, 2018, file photo. U.S. Sen. Angus King of Maine said in a Wednesday statement that he will oppose Brett Kavanaugh, President Donald Trump’s nominee for the Supreme Court, citing “an overly rigid judicial philosophy” and a lack of transparency on his record. The move from King, an Independent who caucuses with Democrats, was no surprise. It also would have little impact on Kavanaugh’s confirmation unless two holdout Republicans — including Maine U.S. Sen. Susan Collins — decide to vote against him, which is unlikely. King, a former two-term Maine governor who is heavily favored for re-election in 2018, also opposed Neil Gorsuch, the Republican president’s last high court pick who was nonetheless confirmed in April. The junior senator voted for 12 of Trump’s original 18 Cabinet nominees. Democrats have hammered Kavanaugh over a belief that he will weaken access to health care and abortion while undoing environmental regulation. They have also criticized the process leading up to his confirmation hearing, in which the White House held back 100,000 pages of records from his time as a lawyer in the administration of former President George W. Bush. In a lengthy statement, King said “there is too much at stake” to confirm Kavanaugh to a lifetime term on the court with “no do-overs or second chances.” He cited several reasons, including “an overly rigid judicial philosophy,” his views on presidential power and the “ridiculous” withholding of records from the Bush administration. “As I began, there is no second chance on this, and given the stakes as well as what we do know of his record, I have no choice but to vote no,” he said. Trump unveiled Kavanaugh in July as his pick to replace the retiring Justice Anthony Kennedy, who has often been a swing vote in landmark cases, calling him “one of the sharpest legal minds of our time” He said during his 2016 campaign that he would pick anti-abortion justices.